You may not be afraid of the Boogie Man anymore, but you might be afraid of losing your toe to the deviously-sharp end of your bed frame. If you’re stumbling on your way to the kitchen for a midnight snack, then some night lighting is in order. Rather than clutter your outlets with tiny glowing moons and bunnies or blinding yourself by turning on the bathroom light, we have a few ideas on how to implement more mature versions of childhood night lights. Swap that Winnie the Pooh night light for something with a bit more grown-up appeal. Shadow boxes can be crafted in a multitude of ways, mainly using wooden boxes or paper. Design your own shadow box with paper, battery-operated LED fairy light or mini lights, something sharp, and a hefty amount of imagination. Then lie down and enjoy a night light of your own creation; it makes great wall art too. If you’re just tired of staring at the stucco above your head, then you may want to revamp your ceiling by bringing the night sky inside. Many people love the idea of a starry night sky inside their den or home theater but you can also grab a piece of the Milky Way for your own bedroom or your kid’s nursery. This is moderately involved but highly documented DIY project. Depending on the type and size of your ceiling, you may have a lot of work ahead of you. Either way you will need to consider the placement of the power source and the size of your fiber optic strands. Typically, people opt for several strand sizes to create a more realistic effect. Christmas lights aren’t just for the holidays. You could create a shimmering canopy over your bed with fabric and cool white string lights or use warm white lights on the headboard. Add string lights to any part of your bedroom décor—vanity mirrors, floor lamps, or even the ceiling. You don’t need a bunch of overhead lighting on a late night run to bathroom. Consider installing baseboard lighting to make feet-friendly hallways. You can have small light fixtures built into the base molding or use battery-operated night lights to provide low level lighting even if your home loses power. These wire-free night lights could also deliver lighting to that hall closet, the haven of miscellaneous items and home to the jacket you use when you take out the trash after dinner. We’ve discussed the pros and cons of different types of under lighting before. Puck lights use wired setups for halogen or xenon bulbs, and either wired or wireless setups for LED bulbs. Some people chose to wire their cabinet lighting to a separate switch for more control over light levels and sources. Puck lights can supply an ambient glow to your kitchen or simply highlight your countertops and that last piece of chocolate cake. The night lighting possibilities are endless with LED strip lights or rope light. You can line your cabinets or back light your TV with strip lighting. Try tucking rope light into the bottom of your bedframe to add muted light without disturbing your sleep. Rope light is great for curves, so you could also wrap it around your headboard or spell words in cursive for art that doubles as a night light. Strip light is your go-to choice when you need a straight line or right angle and can also be used to line your staircase in several ways. Do you have a bright idea to chase away the monsters or guide you to your favorite nighttime snack? We welcome your suggestions or questions in the comment area below. Find more unusual lighting ideas on our Facebook, Twitter, Google Plus, LinkedIn, or Pinterest. 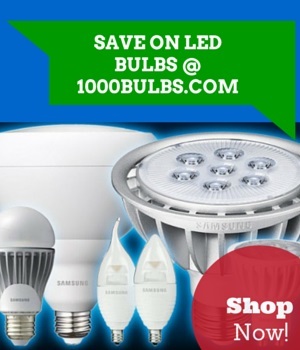 Our 1000Bulbs.com staff is happy to help you choose the right lights from our ever-growing inventory, so give us a call at 1-800-624-4488 and we’ll get you started on your project.